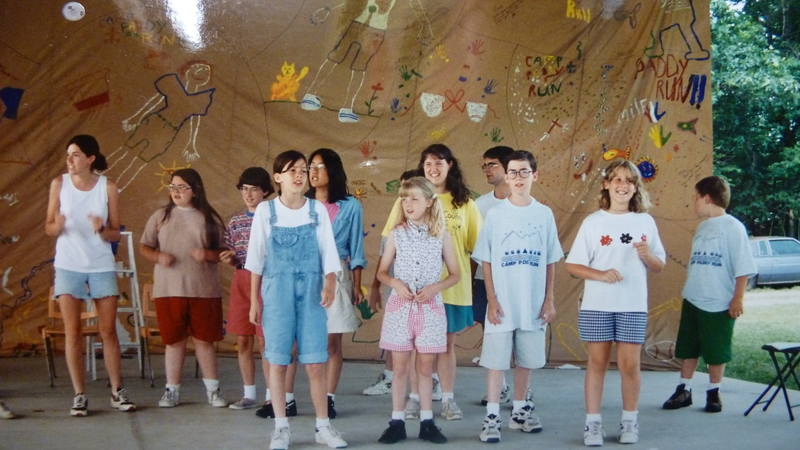 Singing in harmony: A two-part blog post on summer opportunities for families. I can’t imagine sending my children off to camp for a whole summer like people do in books or movies: not just the expense, but what are families for but to enjoy special experiences together in summer? Of course I highly value new opportunities and experiences for children. But even a week away at a camp, multiplied by three children, seemed like a huge stretch on the family budget. So I’m grateful for all the experiences our church helped provide for the kids. 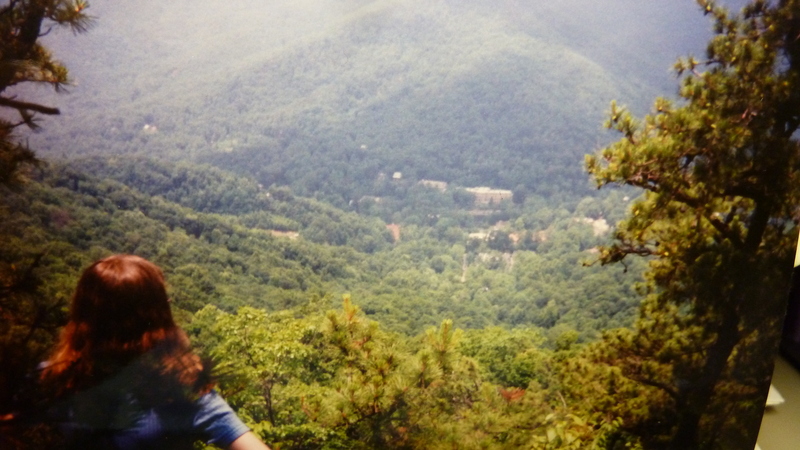 Michelle overlooking valley at Montreat, N.C.
For many summers of their childhood, they were able to participate in the Presbyterian Church’s wonderful Music and Worship Conferences held at Montreat, N.C.. They also went to a more traditional church camp in the woods and fields, Paddy Run. 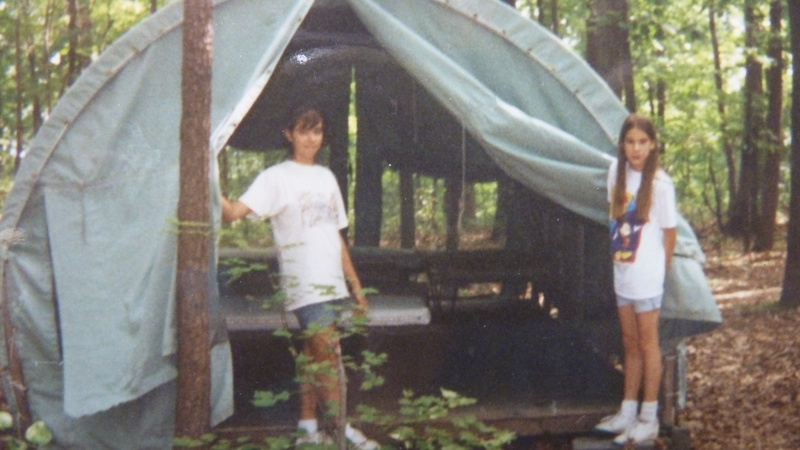 Top: Doreen, middle in pink shorts, at drama camp, Paddy Run, Strasburg, Va.
Bottom: Friend Allison and Tanya at Paddy Run music camp. For their music involvement we are indebted to John Held, who started a children’s choir at our church. With his beautiful tenor voice and charming Tennessean ways, he got the children interested in singing some pretty high falutin’ choral music, along with enjoying silly warm up music and folksy-guitar-led sing-alongs. He and his wife, Ann, our pastor, took them to the music conference at Montreat for a number of years. John is no longer with us, succumbing to cancer at the age of 59, but his legacy certainly lives on, in part through a fund at our church to help other kids have these enriching musical experiences. 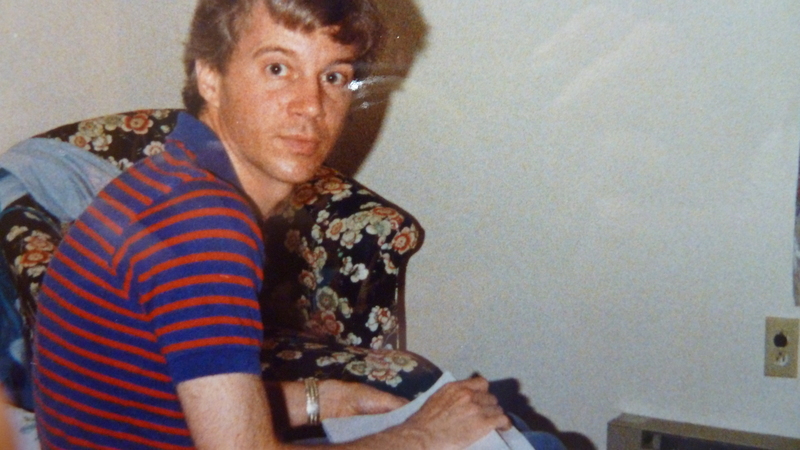 John Held, in a cabin at Montreat, checking music literature. In the spring of 1996, John told me that composer Helen Kemp would be again leading the elementary aged children at the Montreat Music and Worship Conference (organized through Presbyterian Association of Musicians, PAM). Our older daughters had already been privileged to sing under her inspired direction; that year Doreen would be the right age. Did I want to come along for the week and (ahem) cook for all the kids in our church’s group, and finally see Ms. Kemp at work? I would and I did, taking advantage of her open rehearsals where I observed first hand her magical ways with children. More on that in my next blog post. As recently as two years ago (2011), she gave a homily at her alma mater, the Westminster Choir College. I believe she’s still living but has to be nearing 90. For some 38 years I’ve straddled Presbyterian and Mennonite worlds, having been brought up in the rich tradition of Mennonite a cappella singing. But I have to say our small (Pres.) congregation’s singing is not too bad either. We have a tradition of singing only with a piano, in a sanctuary built to enhance live acoustic sound (rather than the deadening effect of carpet and drape), so people actually sing heartily, rather than being drowned out by an organ. Plus we’ve had a long history of having the head of the vocal music department at James Madison University as the church’s volunteer musical director, John Lyon. Hearing and singing good music each Sunday is a gift not all kids get. I’m happy to say our current assistant to the pastor, Tonya Menard, continues the tradition of a fine children’s choir at Trinity. All of our daughters found their high school niche and most of their friends in music programs at school: band (concert, marching and jazz), two in honors choir, piano, flute, trumpet and French horn lessons. 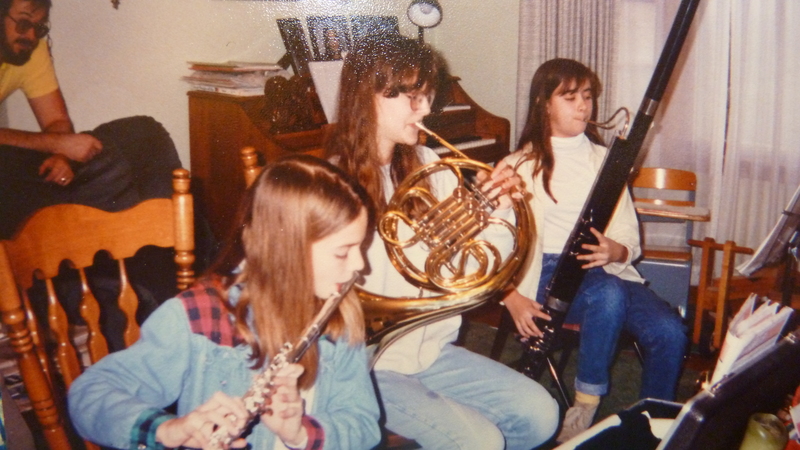 Music with friends: Tanya on flute, Michelle on French Horn, friend Allison on bassoon. Note husband in background enjoying his living room symphony. Tanya eventually followed a career in music, majoring in flute and music industry at JMU, and is now artistic director for the Charlotte Symphony, N.C.
We found that most kids participating in music programs in the public schools to be the kind of kids who were so busy practicing with their various ensembles they didn’t have time for the typical high school vices of drinking and drugs. I also noticed that many of the kids in choir were kids who sang in church every week. 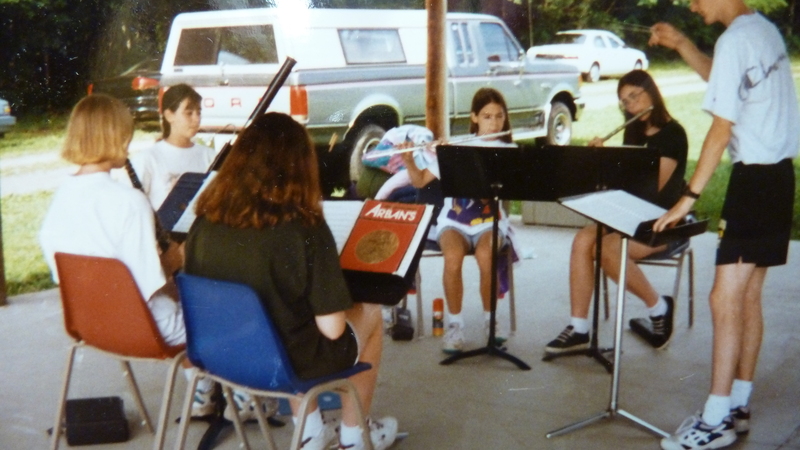 A music camp at Paddy Run. Next time I will describe what it was like to observe Helen Kemp, the grande dame described above, at work conducting this child and 200 others. 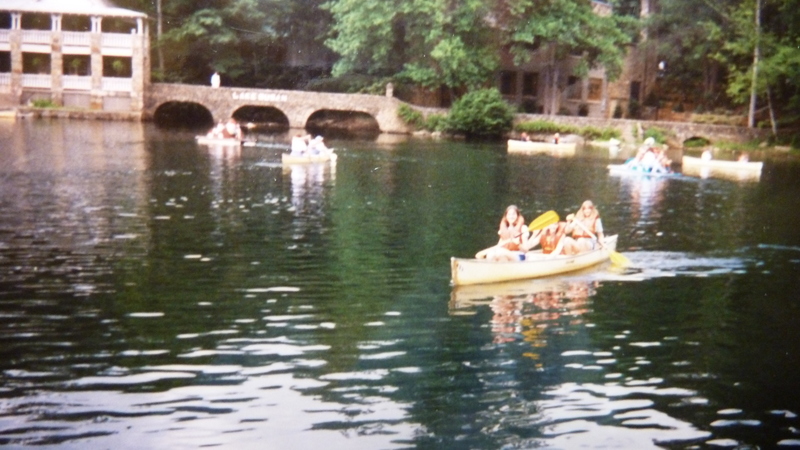 A tradition at Montreat: paddling on Lake Susan. Come and enjoy musical Montreat with me tomorrow.